Social media provides businesses of any size with the opportunity to reach large masses of people for pennies on the dollar compared with traditional advertising methods. In fact, one of the reasons that social media platforms like Facebook are so alluring to small businesses is because business users can even advertise their business for free. And when you're a small business with an infinitesimal marketing budget, 'free' looks pretty darn good! But do note that setting up a Facebook business page and using it to distribute marketing content isn't the only way to leverage your potential customers' use of social media. In fact, even though free methods are extremely effective and can produce lucrative ROI's, it is still worth it to consider paid ads on Facebook. After all, paid advertising is how Facebook was able to grow into a multibillion dollar company, and these days, paid ads are a lot more sophisticated than they were a few years back. 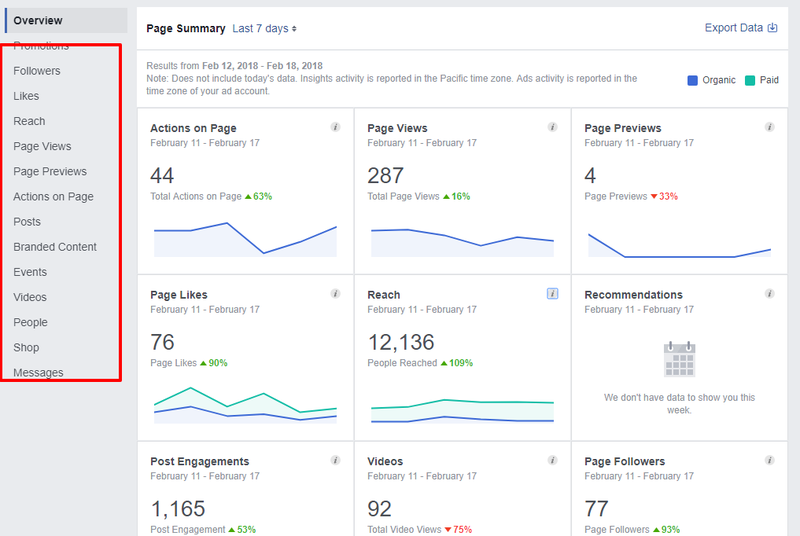 So today, we're going to take a look at a few Facebook ad strategies that will help you reach as many leads as possible (and get them to take action!). Prior to even starting the process of building ads, you need to understand and document who your customer persona (or avatar) really is. Yes, this is a boring and mundane step, but it's absolutely critical to your campaign's success. It's the first thing we do with a new paid ads customer, and we won't run ads without it. Both of these narrow-minded mindsets can ruin your ad campaign before it even gets started. You need to be specific about who your customers really are and document it carefully. And if you're unsure about the answers, pick out your best customer and emulate them for now. Then over time come back and rework the persona worksheet. You'll end up with a great persona (or more likely personas). There's another piece to the puzzle that you'll need to consider as well - where is the visitor in their journey with your business? Are they totally cold, having never heard of your business or product before? Or are they a past customer that's looking for an upgrade or additional help? Cold customers need to be warmed up, they need to feel like they trust your brand. Prior to any purchase they need to be made to feel like they want to do business with you. If you just dump them straight to a page that has hard sell copy, forget it. They'll hit the back button and you'll never see them again. But you still get to pay for their visit. Isn't that nice? Warm or past customers should be treated differently - they already know or trust you, so you can get straight to the facts. Sure, you'll still want to use trust factors to improve the possibility that they'll buy from you, but you don't have to treat them like virgin visitors. It's important to make sure you understand where in the journey visitors are with your business. Once you understand who they are and where they are with your business, you can start working on actual ad strategy. NOTE: The persona worksheet mentioned earlier is the first of three documents we use with a new client prior to building their ads. Learn more about the entire process and get free access to all the worksheets in our on-demand Facebook Ads training. Did I mention it's free? Ok, let's get started with some strategies. These days people move a mile a minute, and most visitors don't have the time (or patience) to hunt around your site. If they clicked on an ad because they thought the product or service would solve their problems and meet their needs, they expect to be guided towards their goal. Linking a Facebook ad to the home page of your website is a rookie mistake and creates a poor user experience right out of the gate. Worse yet, it would be a disaster to link visitors to an 'about' page or a contact form. When creating ads, you've got to funnel the traffic to the right place like a shepherd guides his or her sheep. This is where understanding the customer journey comes in handy. There are, of course, some variations in where you link to depending on the product or service you're selling, where you're advertising, and how educated your audience is. For a cold audience, more often than not, you're going to want to direct traffic to a landing page that explains that you understand their problem and you have a solution. For a warmer audience you may be able to link them straight to a product page, or perhaps a blog page that further explains the benefits of your product. Remember - each one of those clicks cost you money, so it's imperative to make the most of each and every opportunity! It's important to take a moment to sit down and hash out a strategy for bids and the upper threshold of what you're willing to spend to reach your target audience. If you don't have limits set ahead of time, you could end up spending one heck of a lot more than you intended to. The good news here is that Facebook has made Optimized CPM (Cost Per Mille - or thousand) the default option. Basically, this will let Facebook handle the finer details so you will avoid overspending. If you're new to paid ads, this is a godsend - it doesn't require a ton of education on your end to get started, and you can be confident that you are using your money in a way that will bring the most back to you in the end. On the other hand, if you know how much ads should (and shouldn't!) cost, or how much per click you're willing to spend, you may wish to proceed manually. Either way, you need to set a firm budget before beginning! What is a Good Starting Budget? We get this question from every client that wants to get started with advertising on Facebook. The easy answer is $300 a month. If you just want a number, there you go. That's $10 bucks a day. That will get you started and help you budget out a successful campaign. But if you want to really succeed, this answer is incorrect. The real answer involves some simple math - if you put $1 in to advertising, and $1.25 or $2 or $5 or $10 comes out, how many dollars do you want to put in? With that in mind, what is the amount of money you can afford to put in to a campaign that will (at worst) bring back in the same amount and increase your overall business exposure? At best, what amount can you afford to put in to a campaign that will generate new leads and purchases? It's 2018, and you're probably already aware that digital marketers can glean reams of information about online shoppers due to the marvels of modern technology. And to be fair, I cannot deny that social media giants have been reproached for targeted online advertising. But whether you like it or not, it has become the norm, and it is a completely morally justifiable way to maximize the efficacy of your digital marketing campaign. Though you may not be able to see every iota of information concerning your audience, you can, at the very least, see their interests, age, education level, employment details, hobbies and other relevant demographic information. And with that information, you can both tweak your persona and modify your ads to get in front of more of people like that. This data allows marketers to drastically increase the quality of leads by pinpointing users who show interest in or value your product or service. This step is crucial and keeps your budget in check. From your Facebook page, click on the Insights link at the top of the page. 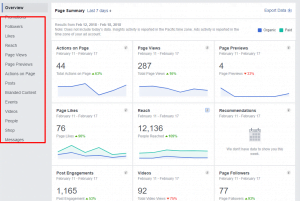 From this page you'll get a great overview of what's going on with your Facebook audience. It's good to take a snapshot of this page and compare it to how it changes as you run ads. If it changes a lot, you may be targeting an audience that doesn't match who's organically engaging with your brand. Pay attention to the left column, especially, as this is where the real meat of your audience information hides. Ads carry a bit more risk than other forms of marketing due to their cost. As such, it should be every marketers goal to maximize every detail of an ad, from the call to action to the attractiveness of your images. And you can read marketing psychology books to glean insight into the human psyche until your eyes hurt, but there's only one way to know for sure which ad element is going to perform better: A/B testing. In it's simplest form, A/B testing is the process of building two exact campaigns, then changing one thing about the second one (the "B" version), and running traffic to both. For Facebook ads, you can do this at the adset level, targeting two different demographic (men vs women for instance), or at the ad level (different pictures for instance). Again, Facebook's algorithm is built in such a way that they automatically optimize your best-performing ads. So it's in your best interest to build multiple ads that are exactly the same with just one variant, and Facebook will learn which ads your audience is engaging with and automatically start to show that one more than the others. Also, note that A/B testing is significant, even if you only have moderate amounts of traffic, because it scales with the number of visitors to your site. For instance, if A/B testing reveals a way to increase your conversion rate by two percent, it may not seem like a lot if you’re only getting 100 visitors per month. But if you were to get 2,000 visitors per month, that’s an increase in 40 conversions. So take the time to optimize your ads, or reach out to someone who does, because even seemingly small details can add up to big gains or losses in revenue. It's pretty thrilling when achieving marketing success, and quite a rush to see content, posts and social media engagement spreading like wildfire. But there is one thing that should remain more important than any other metric: sales. If your ad campaign isn't increasing your bottom line, then it's time to readjust or tweak your strategy. We recently had a client that was very gung-ho about a particular strategy - one that we advised against. It didn't match the customer's journey and wasn't the best use of his money. But he relented, so we built it the way he wanted. $500 later, he suddenly wanted to listen to our ideas. We helped formulate a page that was more in line with the entire flow of his business and he succeeded. Now if you have $500 or $800 to blow on ego, go ahead, I guess. But I'd advise against it. Sales is the endgame, and that should ultimately be the focus. How you get there is important, but at the end of the day this is the number that determines your paid ad success. Sure, there is some ancillary benefit to capturing subscribers' email addresses or garnering more “follows” to grow your audience, but the ultimate goal is to increase sales. Social media “likes” don't mean anything unless you see sales increasing as well. And remember - success isn't measured by how many people click on your ad, especially if only the tiniest fraction of a percent of visitors actually take any action at all. Just about everyone business engages in some sort of Facebook advertising these days, whether it’s taking advantage of the platform for free content marketing, buying Facebook ads, or just setting up a business page for location data and contact information. If you do decide to buy Facebook ads, however, don’t take it lightly. You really need to batten down the hatches and have a plan in place or you could end up spending a lot more than you initially intended!